Thanks for the response to this puzzle. I got correct answers from three people – Ashutosh Diwakar, Rajeev Deshpande and Pallav Pandey in that order. Well done! The answer is 27 minutes and 41 seconds past the hour after 6 pm. In one hour or 60 minutes of duration, hour hand is shifted or advanced by 5 minutes. So, let’s suppose after 6 o’clock, it takes another x minutes to reach the condition mentioned in question i.e. reflection should show the same timing. In 60 min., hour hand is advanced by = 5 min. 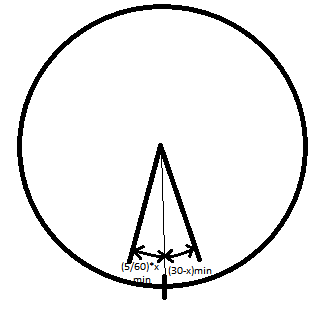 In x min., hour hand will be advanced by = (5/60)*x min. Now, at this time w.r.t. 6 o’clock, minute hand will be back by = (30-x) min. Therefore, (27+9/13)min. after 6 o’clock, the reflection in the mirror will show the same timing. This entry was posted in Solution and tagged algebra puzzles, Alok Goyal, Clock Puzzles. Bookmark the permalink.